Call it by another name!!! It’s rare for cinema to come quite so close to perfection as Call Me By Your Name (Luca Guadagnino, 2017). The Oscar for Best Adapted Screenplay earlier this month was well deserved, and the legions of devotees on Twitter to be expected. 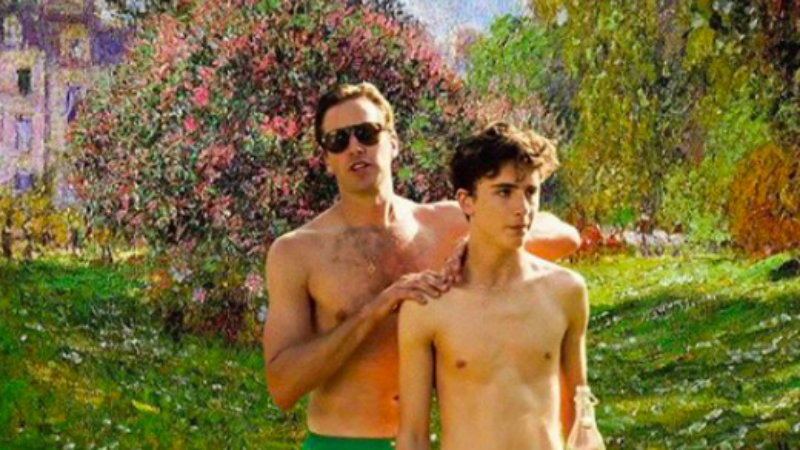 That Instagram account where lead actors Timothée Chalamet and Armie Hammer are superimposed over Monet canvases captures the essence of the picture perfectly (pictured above and below), in a bizarre way. Much like a snatched afternoon trip to the Musée de l’Orangerie, with its impressive exhibition of Monet’s waterlilies spanning the entire length and breadth of the walls, Call Me By Your Name feels like a fleeting glance into something much bigger than oneself. A snapshot of a world more delicate, more fragile, than our own. A world where you’re welcome to come and look, but unfortunately where you can’t stay. The museum is closing, and the reel has run out of film. It’s is also unique in the way it depicts gay romance, being that it is one of the only noteworthy works I can recall which does not eventually circle around into some sort of unbearable misery. The traditional queer breakdown scene is absent, as is the tearful coming out, the familial rejection, the violent assault, the tragic untimely death. The overwhelmingly negative story arcs occupied by gay characters in both mainstream and arthouse media have a funny habit of leaving a bad taste in the mouths of young LGBT people. And I’m not talking about homophobic works, about the queer coding of villains, but the films the community reveres and holds up as our own. Brokeback Mountain’s (Ang Lee, 2005) Jack Twist is murdered by a gang of passing homophobes. Sook-hee and Hideko’s relationship The Handmaiden (Park Chan-wook, 2016) verges on abusive, founded on a veritable mountain of lies and deceit. 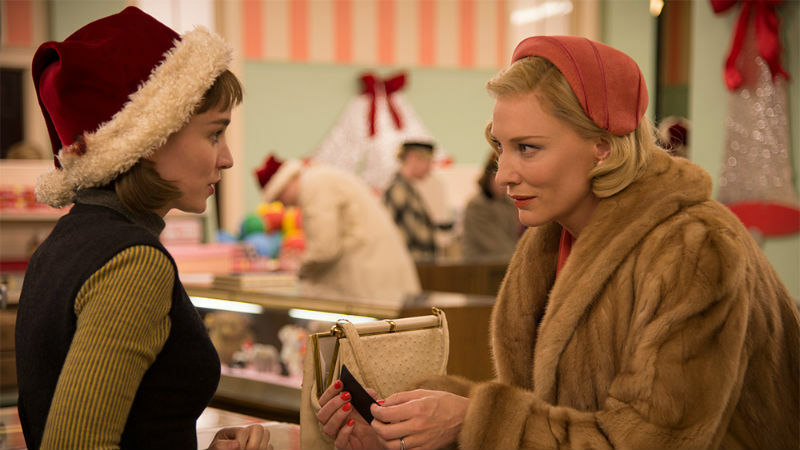 The eponymous Carol (Todd Haynes, 2015; pictured below) loses custody of her daughter. Moonlight (Barry Jenkins, 2016) is a lifelong chronicle of one man’s struggle to come to terms with his identity. The message starts to become clear. You’ll suffer, if you’re queer. While Call Me By Your Name may not neatly tie a bow around Elio and Oscar’s relationship with all the fairy tale charm of a romantic comedy, at no point does their homosexuality cause them undue heartache or suffering. Neither feels ashamed of their attraction to the other. Their family and friends are accepting of the relationship. There isn’t even any ill will from Elio’s ex-girlfriend Marzia, who gets a rather raw deal from the entire situation. No one is left beaten to a pulp on the pavement. Chalamet’s tearful Visions of Gideon closeup does not play out underneath the yellow light of a hospital ward, as his lover wheezes out his final breath. 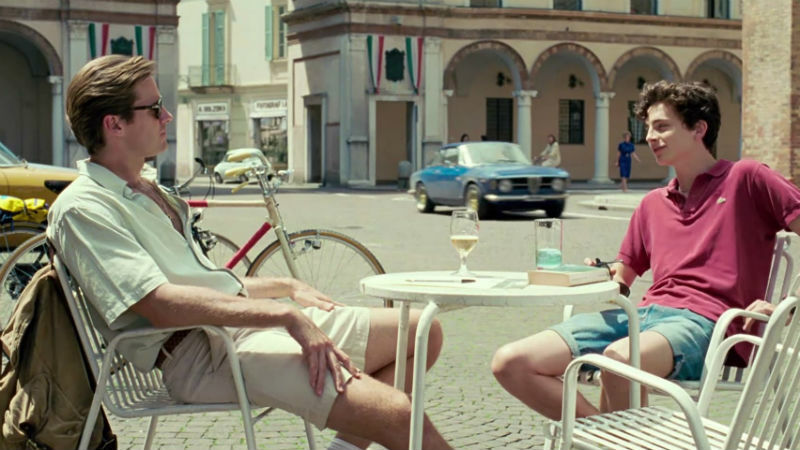 Elio and Oscar may not ride off into the sunset together, but the extenuating circumstances which tear them apart are not founded in prejudice or violence. This is what made the film radical. Call Me By Your Name demonstrated that queer love could exist on screen, not to be some parable of noble suffering, but to simply play out for its own sake. Director Luca Guadagnino told USA Today on the Oscars red carpet that a sequel was in the early stages of production, loosely based around the epilogue of André Aciman’s original novel. He plans to set it five years on – the original film is set in 1983 – and deal directly with the AIDS crisis. This is where the proverbial fly begins to make its way into the ointment. I preface what I’m about to say with the following: queer narratives where characters suffer as a result of their queerness remain deeply relevant, and will do as long as the community continues to face undue discrimination and misery. This particularly applies to stories concerning the AIDS crisis. Furthermore, it’s not unreasonable to suggest that Elio and Oliver get an easier ride than other queer characters because they’re two affluent white men, which is worth keeping in the back of the mind when discussing LGBT sorrow in film in this context. Gay narratives can hardly be expected to exist in an a political vacuum, at least not quite at this stage in history. But to create a sequel to Call Me By Your Name which leaves the rose-tinted world it presently depicts, to hit it with a cold harsh dose of reality, dilutes what was ultimately innovative about it. It’s like spray painting a vital political statement over Monet’s water lilies. There’s a time and a place, and for once it’s not here. Only having access to queer cinema pockmarked by pain is devastating for children growing up gay, as they come to believe this is all their life can ever be. 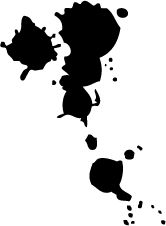 Subliminally, they are told they carry within them a defect, and someone somewhere will always be conspiring to punish them for it. I’m sure Guadagnino would create a work of abject beauty for this proposed sequel, if his filmography thus far is anything to go on. I’m sure I’d enjoy it, too. But if this is the direction he plans to take, then I fear it may dilute what made it the original work beautiful. By all means, make a film about the Aids crisis – cast Chalamet and Hammer all over again, for what it’s worth. But make them different characters, make it a different world. Let us keep our happy gays. We have so very few. We need positive queer narratives. We need stories where boys can fall in love with boys and girls can fall in love with girls without fear that some outside force will make them hurt for it. We need bike rides through the Italian countryside, we need impromptu dances parties set to the Psychedelic Furs, we need that whole saga with the peach. We need friends and families who accept us as we are, we need beauty and art and life, and we need to know that if it all falls through it’s not because we were queer and that meant we weren’t allowed to be happy in the first place. We need Call Me By Your Name. Unadulterated, and as it is.